The TD Vancouver International Jazz Festival�”celebrates its 26th edition with a stellar lineup that includes international headliners like Wynton Marsalis, Paco de Lucia, Madeleine Peyroux, Colin James, Steve Earle, Lucinda Williams, Christian McBride, Trombone Shorty, The Bad Plus, Atomic, Ana Moura, Gonzalo Rubalcaba & Richard Galliano. Since its inception in 1986, the TD Vancouver International Jazz Festival has “set the standard for excellence, creativity, and positive energy,” to quote New York trumpeter/composer Taylor Ho Bynum. Established legendary musicians and emerging artists�”whether working in traditional forms or developing their own distinctive paths�”find opportunities to pursue their dream projects, experiment with new ideas, or refine existing concepts at the Festival. Vancouver’s signature festival and British Columbia’s biggest music showcase will animate the city for ten days June 24 – July 3. From noon to the wee small hours, a rich tapestry of jazz, blues, funk, Latin, fusion, electronica and world music will fill the air at venues big and small, indoor and outdoor across the city. 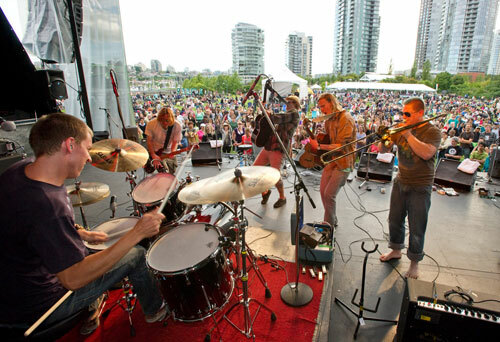 By taking the music to concert halls, parks, community spaces, clubs, public plazas and neighbourhood streets, the Jazz Festival will electrifies Vancouver with over 400 concerts and stirs the souls of more that 500,000 people each year. The festival will feature over 1800 musicians from Canada and around the world performing at over 40 venues citywide. There will be approximately 150 free concerts including Gastown Jazz on opening weekend (June 24-25), Canada Day on Granville Island, and the Jazz at the Roundhouse & David Lam Park free concert extravaganza on closing weekend (July 2-3).